So, you’re thinking of having solar panels installed on your home. Great idea! Solar panels are an excellent way to power your home, reduce your carbon footprint, and provide jobs for your community. But now that you’ve made the decision to look into solar panels, there are a few things to keep in mind. Alternative Energy Services encourages you to keep these factors in mind when you’re considering having solar panels installed on your Salt Lake City Home. Can Your Roof Support Your Solar Panels? The age of the roof: A typical roof can go 20-25 years between replacements. Similarly, solar panel arrays are warranted for the same amount of time. So if your roof is at the end of its life, it’s wise to have it replaced or repaired before you install your solar array. This way you won’t have to undo your entire new array just to replace your roof. HOA regulations: While increasingly more and more homeowners associations are encouraging residents to invest in solar panel installation, some continue to have regulations against them. For the most part, this is for aesthetic reasons, as some feel that solar panel arrays are a blight on the visual appeal of a home. 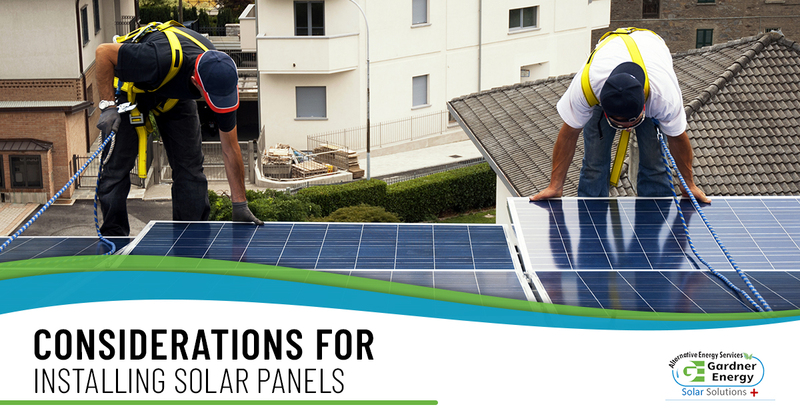 Before signing up for a new solar panel array, make sure to clear it with your HOA. The size of your roof: The success of your solar panel array is as contingent on the size of your roof as it is on how much sun it receives. The fact is, if you have a small roof, you may not be able to install enough solar panels to meet your energy needs. Once you’ve examined your roof, you can make the decision as to whether your roof is capable of supporting a solar panel array that will provide your home with enough energy. Energy usage: Take a look at your energy bills over the last years. Likely, you’ll see spikes in the heart of winter and the peak of summer when temperatures are at their most extreme and you’re running your HVAC systems the most frequently. Generally, the more energy you use in a month, the more solar panels you’ll need. Sun exposure on your roof: The fact is, if your roof doesn’t get much sunlight throughout the day, then investing in solar panel installation is probably not a wise choice. You can get a sense of how much sun your roof gets by using Google’s new Project Sunroof app. Enter your address, and Google will tell you how many usable hours of sunlight you get per year. If you get more direct sunlight, you might be able to get away with fewer panels. However, if your roof isn’t in the direct path of the sun, you might need more. If after looking into these factors, you’re still unsure as to whether or not your roof can support a solar panel installation, don’t hesitate to call the professionals at Alternative Energy Services. Since 2004, Gardner Energy Services has been helping homeowners and their families install solar panel arrays that reduce their reliance on traditional energy sources. We also can install other alternative energy systems in your home, like wind and hydroelectric systems. Call Gardner Energy Services today to schedule your consultation.